>> What Happens When You Drink Bad Wine? Does It Make You Sick? You’re finally home after a long day of work. Your bottle of goodness awaits for you in the wine cooler. It’s just the right temperature when you take it out and uncork it. You pour a glass and already imagine the chill sensation of the drink going down. But wait! The wine has a funny smell or taste. It’s gone bad. Now the question is, what happens when you drink bad wine? Does it make you sick? To a connoisseur, the question could seem trivial. No. Bad wine won’t make you sick. But it won’t taste good either. And now that you know bad wine won’t cause you any harm, perhaps you want to find how to detect a faulty wine and why you shouldn’t drink it. Faulty Wine vs. Flawed Wine: What’s the Difference? There is a fine line between a faulty and a flawed wine. According to the Wine Research Institute, there are simple ways to detect a faulty – or bad – wine. However, before getting to flavors and aromas, I would like to explain in my own simple way how I view the differences between faults and flaws. Just imagine that everybody perceives taste exactly the same. Well, this isn’t realistic, isn’t it? So for illustration purposes, I am going to suggest that the small differences which make individuals unique are flaws. In a similar way, in wine, a flaw is a minor difference from what is seen as normal wine characteristics. It isn’t necessarily a fault; it’s just some people can handle it while others can’t. But when a flaw becomes so pervasive that it is all you can taste, that flaw transforms into a fault. But why do faults occur? There are many technical reasons for these defects, and way too many for a casual wine lover to remember. Not only that but being able to notice these faults or flaws is subjective and entirely up to the taste preferences of the consumer or their experience with wine. 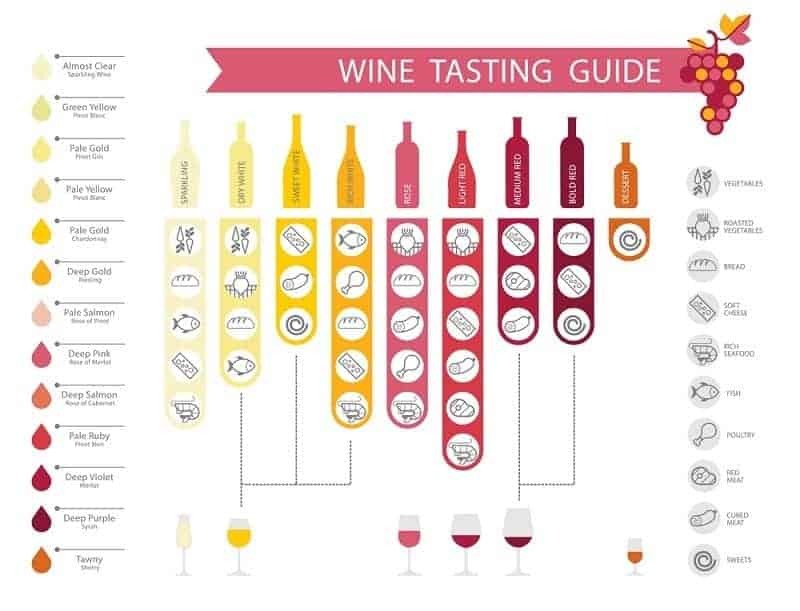 However, in broad terms, wine faults are internal and typically related to fermentation or winemaking. Wine flaws, on the other hand, originate from external sources. For example, a fault can be the result of a poor winemaking process or less than ideal storage conditions. It could also be the result of poor hygiene during winemaking, excessive or insufficient exposure to oxygen or sulfur. The winemaker might have used dirty wine barrels or poor quality corks. And the reasons can go on and on. On the other hand, a flaw determined by an external source could happen when a retailer displays their wine in direct sunlight or keep it in unsuitable storage, or even serving wine from dirty glasses. Whatever the reason, I tend to categorize them as it follows – a flaw can be just a quirk in the wine’s personality whereas a fault may make the wine undrinkable. But how can you tell the difference? Here are six of the most common causes of faulty wines and how to recognize them. Perhaps the most common fault that everybody alludes to, but it can be easily misunderstood. In reality, corked wine means the cork has become infected with a chemical called TCA. It’s a natural compound forming on plants and is harmless at low levels. Moreover, modern-day corks are treated against it early on, so the incidence is becoming lower. First, understand the term has nothing to do with small bits of cork floating in your glass. Sometimes you can’t even detect that something is wrong from directly smelling the cork. However, when you sniff the wine, you will notice wet cardboard or smelly dog smell. Different people have different sensitivities to TCA so don’t be surprised if your drinking partner’s nose isn’t as offended. You won’t get sick if you do drink it, but a fresh bottle will show you what you’re missing. Brettanomyces is a strain of yeast commonly referred to as “Brett.” It is omnipresent in winemaking. You can find it in the air, on the grapes, in barrels,and even inside the winery. It gives an earthy aroma to the wine, which most people enjoy. But too much of it though can make it taste like it was poured off the side of a horse. Generally, Brett smells and tastes like a barnyard—manure, sweaty saddles, stables, gamey meats, and similar aromas. A hint of bacon or leather might not be a bad thing in wine, but a full hint of manure should tell you to send the bottle back. This fault is just what it sounds like. The wine has been allowed to overheat. This can happen from sitting in a loading dock at high temperatures, stored in a basement or even in an attic beside a heater or over a pizza oven. It can overheat while staying in your car on your way home or because it was stored improperly. Constant temperature is the key to storage, so don’t store your wine in an overly heated place. Cooked wine gives you a whiff of stewed fruit aromas or a raisin-like smell. A very obvious hint is where the cork sticks up out of the neck of the bottle because the wine has expanded in the heat. You know when you leave a sliced apple on your kitchen countertop, and it turns brown? Wine suffers the same process. Oxygen won’t spoil it immediately, but in the long term, it’ll make it go off. Similarly with wines, if you leave a bottle open for say a week, it won’t last and won’t taste good. You will typically notice a change in color. Red wine will turn brown or brick-red, whereas white wine will darken. Smellwise, oxidized wine smells like caramel, so it’s kind of inviting. This is the opposite of the above oxidation. During the winemaking process, the beverage might be exposed to oxygen sufficiently. Wine reduction is described as the wine smelling of sulfur or rotten eggs. Some winemakers describe it as smelling of burnt rubber. If it is only a mild whiff when you open the bottle, try decanting the wine to add oxygen before drinking, which might solve your issue. Perhaps the hardest fault to spot as it occurs naturally in most wines. It’s where bacteria creates acetic acid, which is fine as long as it’s in small doses. But acetic acid is what gives vinegar its distinctive flavor, and it will eventually turn your wine into vinegar without doubts. You will definitely get a whiff of vinegar from the wine, and sometimes it might actually taste like vinegar. If you’re unsure whether or not the wine has gone bad, perhaps it’s best to just change it with a bottle you like. 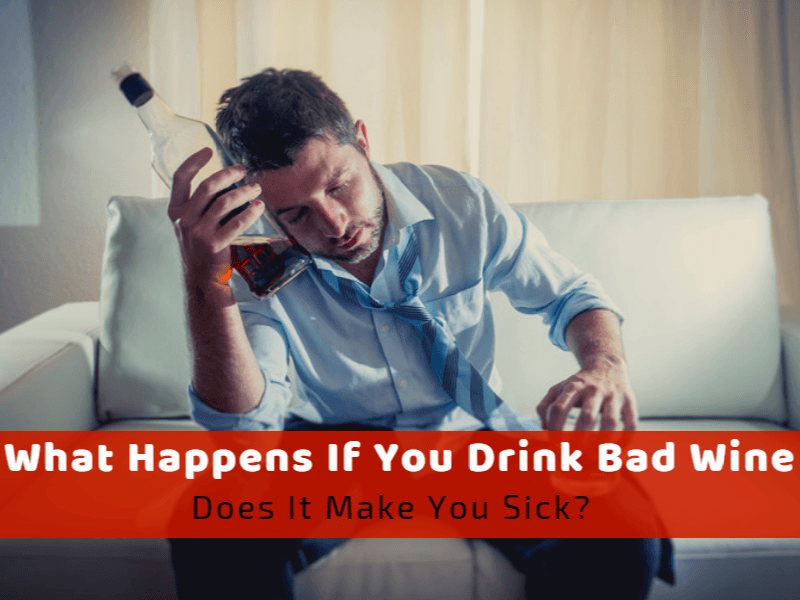 So, will bad wine make you sick? Definitely not. However, it’s unlikely that you’ll ever enjoy it. The best thing to do if you suspect you’re drinking bad wine is to just uncork a new bottle. After all, you’re not drinking just for the sake of it. You’re drinking because you truly want to enjoy your drink. Wondering what to do with bad wine? Well, you could let it transform into vinegar, or just pour it down the drain and enrich your collection with a few new and unspoiled bottles!